The mxfSPEEDRAIL F1000 is a high quality centralized, multi-format and metadata-rich ingest system that transfers material between editors, devices, servers and network folders. 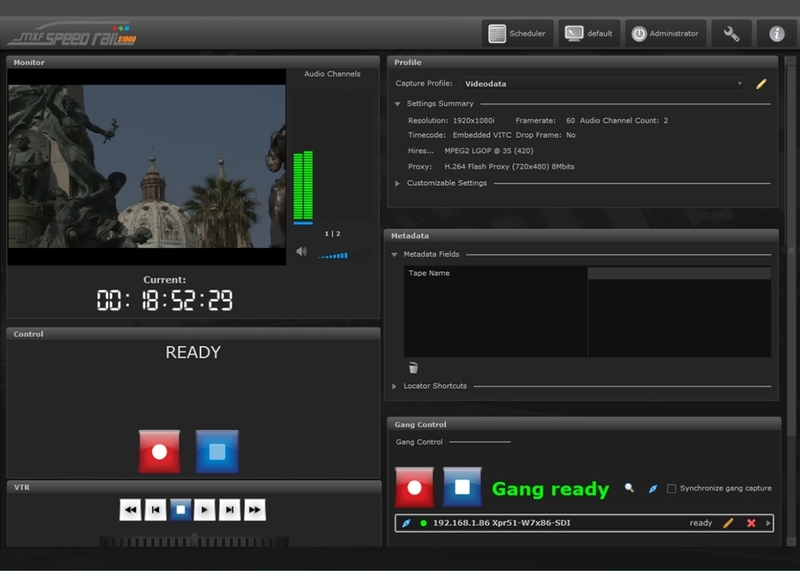 Using an automated method, the system starts the ingest process, preserving camera metadata, including XMPilot XDCAM, and supporting new audio swap and replace capabilities. The mxfSPEEDRAIL S1000 is a powerful and flexible multi-format SDI recording system that can not only fulfill the capture requirement of baseband signals, but also supports innovative capabilities such as scheduled capture, live-feeds recording, optional fallback storage, multi-camera control, edit while capture and remote monitoring through a web browser. configurable input/output channels (SD/HD/4K ready), Avid Interplay integration as well as a 5-year guarantee. Of course, it supports all industry-standard codecs and formats as well. Located in Vienna, STRYME has been providing and developing tailored professional broad­cast and automation solutions for small, medium-sized and specialized broadcasters for more than 11 years. The Austrian market leader is known for uncompromising quality and reliable out-of-the box solutions that simplify, speed up and optimize daily broadcast workflows.